Police are searching for over a dozen people who damaged Facebook’s German headquarters in the northern city of Hamburg. The unidentified gang smashed windows, threw paint and sprayed “Facebook dislike” on a wall, police said yesterday. Reports state that between 15 – 20 individuals wearing black clothes, masks, and hoods carried out the attack at about 21:00 local time Saturday. An investigation has been launched to find those responsible. A spokesman for Facebook said that no one was injured and that he could not immediately comment on the possible motive behind the attack. Last month, Germany launched an investigation into Facebook’s alleged failure to remove “hate speech” from the site. A growing number of racist posts have appeared on the platform recently, many of which are anti-foreigner comments directed at the high number of refugees entering the country. The prosecution in the case said that the failure to remove the comments could be attributed to Martin Ott, managing director for northern, central and eastern Europe of Facebook. "[W]e can say that the allegations lack merit and there has been no violation of German law by Facebook or its employees," a Facebook representative says. 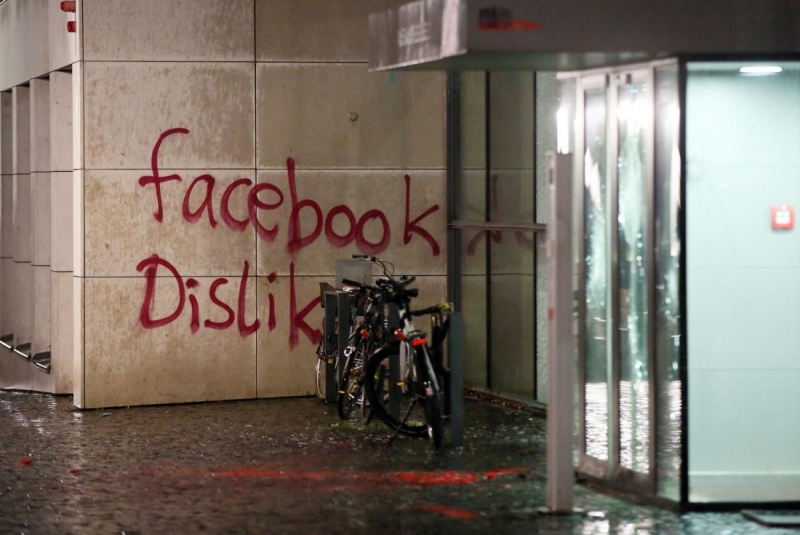 On the leftist Internet page Linksunten, anonymous authors said they had attacked the building to protest against Facebook's overpowering presence online, according to AP. Last week, Mark Zuckerberg announced that the company will fight to protect Muslim rights on the social network and clamp down on racist comments. While many have applauded the CEO’s actions, there are those who see them as an attack on free speech. Facebook has a partnership with a group called FSM, which monitors multimedia service providers on a voluntary basis, and has said it would encourage its users to push back against racism, reports Reuters.